Banana Strawberry caramel is the star of this delicious Easter Trio. 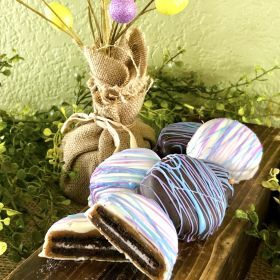 Make your Easter baskets the best ones one the block with our Easter Trio Pillow Packs. We are introducing our new Banana Strawberry caramel! We start with a banana caramel as the base, and we swirl in strawberry marshmallow fluff. Then we wrap them in bright, yellow wrappers for an extra special touch. Our Trio also includes Original and Lemon Meringue caramels making this the perfect treat for Easter! Three pieces of our amazing, hand made, creamy dreamy caramel in an adorable pack. One of each flavor in each pack: Banana Strawberry, Original, and Lemon Meringue. Order a single pack, or get a 5-pack to have plenty on hand for all your springtime adventures. Is a pillow pack just not enough? Order a 1/2 pound of the Easter Trio here.